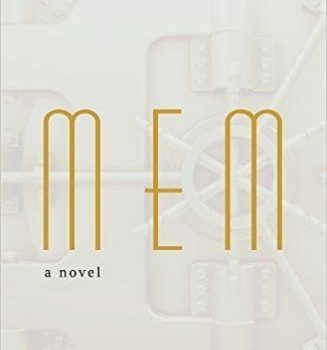 MEM: A Novel, Bethany C. Morrow (Unnamed 978-1-944700-55-3, $25.00, 175pp, hc) May 2018. 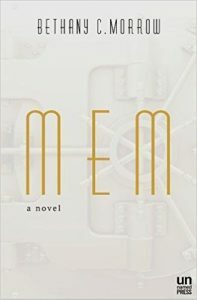 MEM is a short novel with so many complex elements, so many wild and wonderful ideas, that summarizing it proves difficult. Yet the circumstances of its world are set forth so gracefully and confidently that understanding it is easy. In its opening pages a woman walks into a vault and explains to the receptionist waiting there that she is a Mem, a living human figure that walks, talks, breathes, and eats, but was created nearly twenty years earlier through a scientific process of memory extraction. It’s the end of the 1920s in Montreal as the novel begins, but in this alternate version of that era, the wealthy are able to have their unpleasant memories extracted and stored in a vault so they do not have to wrestle with pain or sorrow. 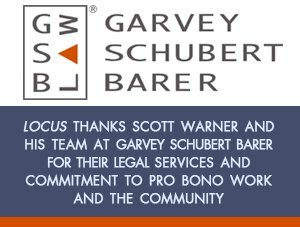 Over the years that this service has been available, however, weaknesses in the process have appeared. People who have too many memories extracted gradually lose their minds in a process akin to dementia, and a legal battle over three Mems extracted as family heirlooms roars on in the background. In the middle of all this is Elsie, the narrator of MEM, and a unique specimen. She is the only Mem ever extracted who has a mind and a will of her own. All the other Mems interact not with the world around them, but with illusions erected by the memory from which they spawned. In attacking long-ago fathers, they attack real people in front of them; in cringing away from an invisible mugger, they cringe away from an attendant bringing them lunch. But Elsie sees, hears, and participates in the world. She remains 19, the age her ‘‘Source’’ was when the memory which created her was formed, but in many other ways she appears to be a whole and normal person. What kind of people are we if we can’t traverse the landscape of our own memories? What kind of people do they come who refuse? Other aspects of the book are similarly captivating. Elsie has a cinema fascination that stuck in my mind as metatextual: movies could almost be memories extracted on the screen, going through their routines without interacting with the real world. Each chapter embeds stories within stories, rendering each character as a storyteller to another. I believe that storytelling is how we make sense of our lives, and that practice can range from telling a spouse about an argument at work to writing a 300-page memoir. For the characters in this novel to be telling each other stories every time they speak makes them wholly human, as they question and retell their truths in order to discover them. We’d spoken about Mems a thousand times, clinically discussing their short lives and the way they both existed and did not. And though they resembled someone with a life and a light inside them, Mems were something akin to shells, keepsake boxes housing memories sometimes precious but often despised. In its clear words and with a humanist ethical compass at its heart, the book compares favorably to the work of Octavia Butler, although its central characters lose and suffer a lot less than Butler’s tend to. A happy ending is always welcome, but this one seems a little bit saccharine. One of MEM’s only other flaws is the confusion marking its most important conversations. The characters don’t speak very clearly or completely to one another at the book’s heightened moments, and I had to reread these pages again and again, in some cases giving up before I fully understood the implications of the dialogue. Nevertheless, I rank MEM as a new classic, an extraordinary work of careful craftsmanship and intense compression. Bethany C. Morrow has written a jewel of a book: a tiny object refracting light in all directions.